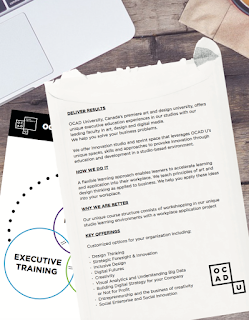 OCAD University is launching a new Executive Education program in a new Innovation Studio and SprintSpace. The OCAD U Executive Education program features a flexible learning approach, enabling learners to accelerate learning and application into their workplace. We not only teach principles of art and design thinking as applied to business, we foster the application of these ideas into individual workplaces, amplifying the learning quotient of participants. We generate “sticky knowledge” to ensure that you can translate learning into practical outcomes for your workplace and career. This new program received a generous gift from Scotiabank to create the Scotiabank Design Thinking Research Studio, a platform for a Design Thinking educational curriculum model that will generate research, workshops, executive education and an annual open public forum. The Innovation Studio and SprintSpace is being built on Toronto's waterfront. The federal government recently announced SIF funding for OCADU's Campus for the Connected World (CCW), an exciting new space in the Daniels Waterfront — City of the Arts building complex. As outlined on our project page, the CCW will house initiatives specific to innovation training, design thinking, Big Data design and accelerator capacity that support commercialization and bring design skills to emergent companies. The CCW space opens in early 2018, and the OCAD U Executive Education launches this spring. Please contact me if you would like more information or to become involved. Thank you so much for your supplied advice about Canada education in this article. I have a question for you. I want to apply for this Executive Education program. I live in New York. Can I apply for this program?